You plug your laptop in the wall outlet and turn it on and - nothing. One of the most frequent causes of a totally dead laptop is a defective power adapter. In this article you learn how to determine if your laptop's power adapter is defective. 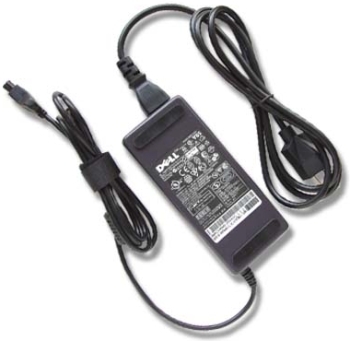 A laptop power adapter consists of an AC line cord plugged into a power inverter with a DC line coming out the other side that plugs into the power port on the laptop. Most people refer to the power inverter as the "brick". I usually call it the "anchor" because when I move it, it feels like I'm dragging an anchor. The function of the power adapter is to convert AC power from a wall outlet into DC power for the laptop's circuitry. Because it takes the negative side of the alternating current sign wave and flips it over to be positive, it's sometimes called a power inverter. It also reduces the voltage level and cleans up the signal. In a desktop computer the power inverter is inside the computer's case. But because the power inverter generates considerable heat, and the designers don't want that heat inside the laptop case, a laptop uses the power brick configuration. Now, I've been troubleshooting electronics for a long long time so I can tell you almost all problems end up being something stupid. For example at my house some of the AC outlets are switched by a wall switch. This is so that you can plug a lamp in them. Now if the switch was turned off and someone had their laptop plugged into it for a few hours, their laptop battery would totally discharge, their laptop shutdown, and they wouldn't have a clue as to why. The moral of this story is - always check the obvious stuff first. 1. Make sure that you're getting AC power from the wall outlet. 2. Make sure the cable going into the adapter is secure. 3. Make sure the cable coming out of the adapter is securely plugged into the laptop. 4. Is the light on the power supply brick lit? 5. Lightly wiggle the plug where it plugs into the laptop. Many people, when they carry a laptop leave the adapter plugged into the laptop, causing the connector to break inside the laptop. One side of the brick has the adapter specifications printed on it. It usually lists the required input voltage as being between 100-240V. This is so you can use the adapter in other countries that use different voltage than the 110V used in the U.S. It also indicates the polarity of the DC plug. The outside of the plug is usually negative and the inside positive. With the adapter plugged into the wall outlet, you can use a multimeter to check the output of the adapter. With the multimeter set to the appropriate range, put the positive (red) probe in the center hole of the plug, and touch the negative (black) probe to the outside of the plug. Do not let the metal of the two probes touch while connected to the plug.